Our Monthly Story Co-oordinator shares her experience as a volunteer of CienciaPR. I am a Puerto Rican scientist and a native from Humacao. Day after day I enter the lab full of energy to learn new things and ask questions about retinal regeneration. Most days I lose the battle and I end my day with a failed experiment or with negative results that do not provide any answers to my hypotheses. And in those days, no matter how disappointed I leave work, science does not extend its condolences. Other days, although those are the least, I return to the lab with the same energy (somehow my energy is renewable, likely because of catching up on sleep) and I find that an experiment yields extraordinary results that support my hypothesis and suggests that I have made a novel finding. Even then, science does not thank me. If you’re asking yourself why is it that I love my job and why I return to work every day, it is because of the satisfaction I gain from training my students. Knowledge is not generated in a vacuum. Today, science is done in a collaborative manner and, at least in academia, it requires a concerted effort from laboratory technicians, students, postdocs, and professors. Training responsibilities increase as you scale up the academic hierarchy. As a senior lab member, I train students on a daily basis. My biggest satisfaction is to see how they evolve in their scientific training and how they develop into be better people and scientists. The laboratory is how the science classroom should be. It is where you see future scientists being born before your eyes. And what does Ciencia Puerto Rico have to do with any of this? Everything. Ciencia Puerto Rico’s main goal is to modernize science education and make it relevant to Puerto Rico. 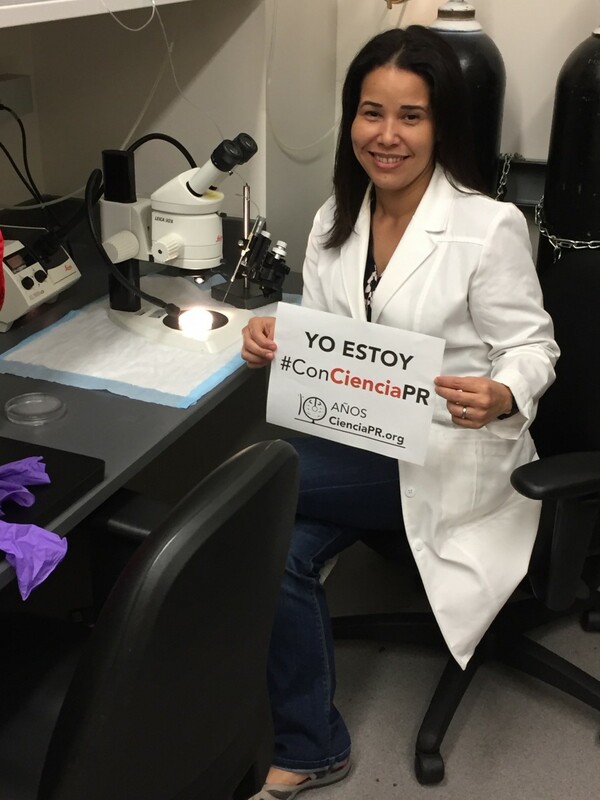 For me, Ciencia Puerto Rico is a space where I can use my scientific training and expertise to serve my country by educating the next generation of Puerto Rican scientists. Although I did not return to Puerto Rico after finishing graduate school, I have never stopped giving back to my country. I continue to work tirelessly for a stable Puerto Rico with capable professionals. I started volunteering for Ciencia Puerto Rico in 2012 because I wanted to practice communicating science in Spanish which is my native language. After studying and working in the United States since 2001, I genuinely worried that I would forget to communicate science in a professional setting in Spanish. To avoid this possible dreadful outcome, I contacted my friend and colleague, Greetchen Díaz, whom I knew since graduate school and who already was a volunteer for Ciencia Puerto Rico. At that time, Greetchen was the coordinator of the website’s Monthly Stories and she recruited me to write some of them. Writing the Monthly Stories became so much more than practicing how to communicate science in Spanish. Writing these stories meant communicating with Puerto Rican scientists, and learning about their work, lives, and professional training. It made me aware of other Puerto Rican scientists that, like me, were generating knowledge everyday. It showed me that there were other Puerto Rican scientists that, like me, overcame similar obstacles and reached their goals day after day. After that personal awakening, writing the stories of other scientists made me realize that the Monthly Stories portray a different reality of Puerto Rico and month after month, they tell the Puerto Rican people that Puerto Rico has high caliber scientists that do not give up. Currently, I am a co-coordinator of the Monthly Stories. I have also worked as volunteer recruiter, in our “Semillas de Triunfo” (Seeds of Success) initiative, and I write for “Borinqueña”. I also coordinated the seminar series “¡Ciencia Boricua!” which took place from March to December 2016 to celebrate Ciencia Puerto Rico’s tenth anniversary. Participating in our initiative Seeds of Success was a life changing experience. Through my volunteer work with Seeds of Success, I saw middle school girls who wished to become scientists and engineers just like I did when I was their age. It also reminded me that, just like when I was their age, I did not know any Puerto Rican women scientists or engineers. Participating in Seeds of Success also reinforced my commitment to mentoring and educating this new generation of girls who will need all of our support to achieve their goals. The satisfaction that I derive from my various roles at Ciencia Puerto Rico is what fills my soul. It energizes me and helps me return to the laboratory every day with resolute commitment even when I don’t know what to expect from the following day. It’s for science and Puerto Rico that I continue pushing forward every day. Even if science does not thank me, I know that Puerto Rico does with all its heart.